In the early part of the decade, women wore tight bodices with high collars and narrow sleeves, much as they had done in the previous decade. From about 1893 however, sleeves started expanding into a leg-of-mutton shape, which was tight at the lower arm and puffed out at the upper arm. 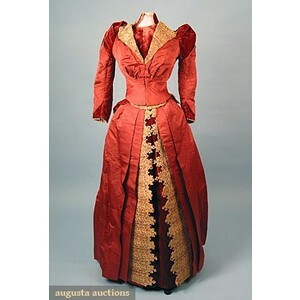 Wide shoulders were fashionable and horizontal decoration on the bodice further exaggerated the line. Skirts were worn in a full-length, simple A-line. Masculine styles and tailoring were increasingly popular, and women sometimes sported a shirt collar and tie, particularly when playing golf or out walking. Hair was worn high on top of the head, in tight curls. Hats were small or wide with lots of trimming, but generally worn squarely on top of the head. 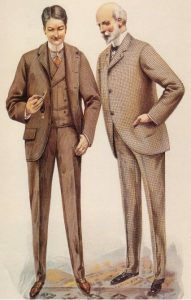 The three-piece lounge suit was very popular and regularly worn from the 1890s onwards, and it became increasingly common to have creases at the front of the trousers. Frock coats were still worn, but generally by older or more conservative men. Collars were starched and high, with the tips pressed down into wings, though by the end of the century collars were more frequently turned down and worn with the modern long, knotted tie style. Hair was cut short and usually parted at the side. Heavy moustaches were common, and older men still sported beards. Some men now went clean-shaven. Next PostNext What would you be reading in 1890?